The quality of these devices seems to be getting worse and worse. The last round was a packet of 8 AA cells which I paid about $20 for. The batteries were made in China with the American name “Duracell.” They were supposed to be rated at about 2.5 Amp-hours but although they were purchased new, they behaved like they were many years old. With a good set of batteries installed, I can usually get to play 6 or 7 CDs on my portable player before the pack of two AA cells would run out of juice. The Duracell batteries died after playing only 2 CDs. It was not just one bad cell in the bunch either. All the batteries had the same low energy capacity. In contrast, I have some batteries which are at least 5 years old and they are still going strong. How do you know when you have a stinker in the bunch? Typical Testing Methods: The conventional way to measure the quality of a rechargeable battery takes time. You first have to fully charge the device. Then, you discharge it, usually at a constant current, and time how long the battery can maintain that current before its voltage drops below a certain critical cut-off point. In an AA battery, with a 2500 milliamp hour capacity, that test could take a while, often days. In theory, with perfect battery, a 2.5 Amp-hour battery could support a 2.5 Amp load for an hour. But in practice, the actual time would be much shorter. Internal resistance of the battery prevents the efficient extraction of that energy. The 2.5 Amp-hour is usually defined with a much lower current, often down to 10 milliamps or so. At such a low current, it would take 250 hours or over 11 days complete a test. That kind of test would be impractical. It may be possible to apply perhaps a 1 Amp load to the battery and compare how long the battery supports that current to a known good battery. An hour long test would certainly be better than one that takes over a week but it is still way too long if you are trying to sort out some bad apples in a box of batteries. I’d like to see if there might be a quicker way. Proposed Faster Testing Method: For many years I thought that a pulsed dv/dI technique might be used to quickly determine the health of a battery. This test involves drawing a heavy current pulse from the battery and measuring the voltage change that results. This technique in fact measures the internal resistance of the battery. A healthy battery, when fully charged, should display a fairly low internal resistance. As the battery ages, perhaps over the course of years of service, the internal resistance should increase. But, the internal resistance will also increase as the battery is discharged. So, this pulsed technique may be used to weed out some fully charged but bad batteries and may also be used to determine how much juice is left in the battery as it is discharged. The first objective in this project is to come up with some statistics, so a typical curve could be plotted showing the relationships between Amp-hour capacity, the percentage of charge and the internal resistance. Overnight Battery Capacity Test: The circuit below should work for testing some batteries over an 8 hour or so period. The circuit draws a constant 200ma of current from a fully charged battery and times how long the battery can support that current before its voltage drops below 1.0v. I’ll use a cheap clock or watch, set up as an elapsed timer. I expect that a good cell will run for perhaps 8 to 10 hours. I should be able to test about two cells per day with this circuit. Delta V Battery Resistance Test Circuit: The first objective for this round of experiments is to see how consistent the internal resistance of some batteries is, once fully charged. 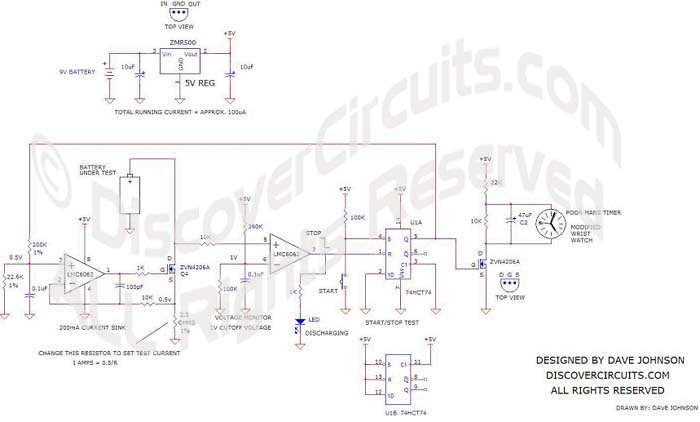 I think I will first try using the circuit shown below. This simple circuit will pulse the battery with 1ms 200ma pulses. I will use my scope to measure the voltage drop in battery voltage with each pulse. I’ll first charge up a bunch of batteries then measure the resistance with this circuit. I then will try to develop a relationship between the measured internal resistance and the measure Amp-hour capacity of the cell. I would expect to see a higher resistance for those cells which have a lower Amp-hour capacity. After those tests, the last step in the process would be to discharge batteries to some repeatable point, and try and come up with a relationship between state of charge and internal resistance. That might take a bit of head scratching. I will share with you my test results.